Tuesday Happy Thought: People still read books, y’all! When Barnes & Noble released the nook in 2009, I thought it was a hilarious joke. Who the hell would want to carry around a light digital pad and forego the satisfaction of holding an actual weighty book with a colorful cover and crispy pages and that sweet paper smell? Clearly I was wrong. So so SO super wrong. People LOVE reading on their little digital pads. It’s minimal. It’s easy. It’s affordable. It’s eco. I get it. But I really like books. Luckily, I’m not alone. People still buy books! I peeked inside to make sure it wasn’t a dreaded book club edition as those can be tough to resell. Once I was in the clear with that, I took a gamble and bought the little guy without looking it up online. The worst case scenario is that it’s worthless and I have a new Hemingway book in my library and am out $1.25. Not a terrible situation. When I finally did get around to researching this gem for resale, I found that I had a first edition on my hands! 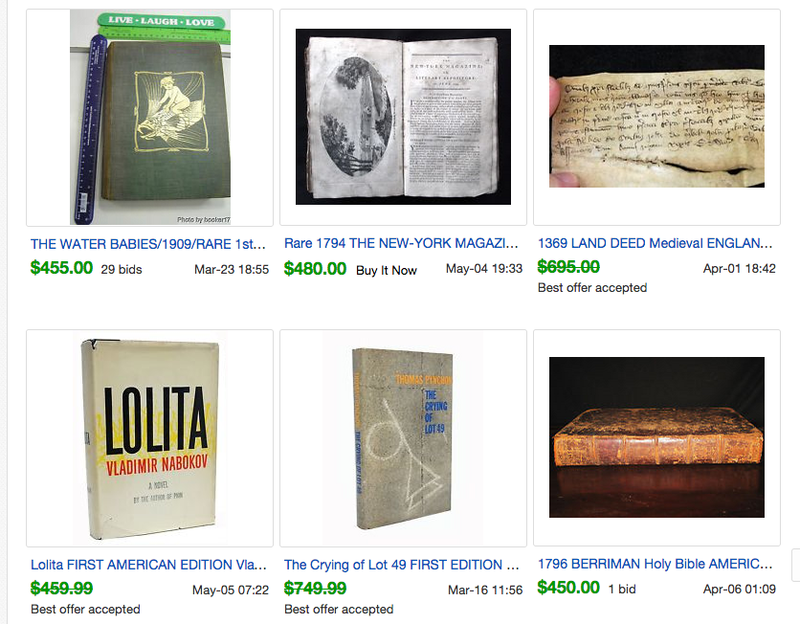 Ideally with books, you’ll snag a first edition and first printing – sometimes noted as 1st/1st on eBay listings. It’s unclear whether my copy was a first printing, but I still made a buck off it. An easy peezy $177 was made. Not bad at all. This photo also illustrates how much listing details matter in netting a fair profit. The first photo is a well cropped close up and boasts “True First Printing” whereas mine is a little less confident in boasting the exact printing but the photo shows off the fair condition and the front and back of the book. And then we have that last one that didn’t even try – the photo looks cluttered and it’s not even right side up! The lesson here is to always give a once over to the books in the thrift store. If it’s older, clean and not a book club edition, you can make a nice low stress profit. No extensive measurements to record, simple photos, and so easy and cheap to ship. 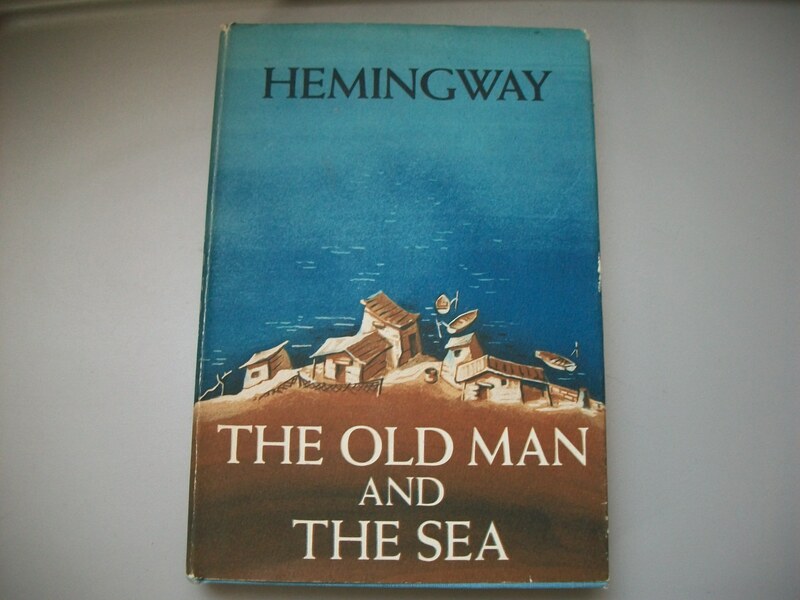 This entry was posted in Resale and tagged $177, books, ebay, first edition, hemingway, old man and the sea, resale by Kate. Bookmark the permalink. So glad you have a new post!! I was just at the thrift store outlet the other day and this “crazy” woman was loading all of these crappy-looking old books into her cart and I thought to myself that she was nuts and probably some kind of hoarder. Wow. I used to be like you, but man, the Kindle Paperwhite is the best thing that ever happened to reading. It’s a really soft light, not like a cell phone. I can read it in the dark and my eyes don’t have to adjust. It tells you how much time you have left in your chapter in minutes and hours or total % in the book. It’s more comfortable, portable, and the battery lasts forever if you turn off wifi. But I’ll still buy a book to re-sell. LOL I’m not past that. I always get the Chilton manuals, especially for any cool cars (mustangs, corvettes, etc.). They sell pretty well even though they’re not amazing prices (think $20+). I saw some really cool RPG/Fantasy chooser your own adventure books at Goodwill the other day but passed since they were selling them for $1.81 a piece! These were tiny and I couldn’t justify it since they’d sell for $40.